The peak of Africa’s Mt. 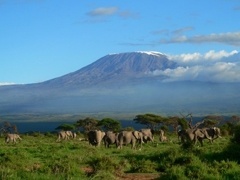 Kilimanjaro is 19,340 feet high. Imagine looking from the base of the mountain and feeling the anxiety and trepidation of the task that lies ahead. Shira Ridge was the name of the route up to the top of Kilimanjaro with the highest probability of reaching the summit. It took longer and cost a little more, but Laurie Nardone reached the top on August 2nd of 2005. The parallels of achieving financial and retirement success, and climbing to the top of Kilimanjaro, inspired the name of our firm. Before we left base camp, our guides had us unpack and display all of our gear for their experienced review. Their job was to make sure that we had what we needed at the start to make it to the top. There would be a lower probability of success if we were unprepared for what lay ahead of us. Before beginning on a financial journey, you need to know if you have the right team and resources to help you succeed. We will check your financial inventory to help ensure that you have the right tools for your personal journey, and plot your route to achieve a higher probability of financial success. While cold and wind were expected, rain and snow were also a possibility. And though our guides could not control the weather, their expertise as to which extra gear was advisable was invaluable. While this gear added extra weight to our backpacks, we felt prepared for any surprises, which allowed us to feel more confident for our unpredictable journey. There are many routes to the top of Mt. Kilimanjaro. A five day trip was appealing—it was less expensive and had fewer days spent in inclement weather. The success rate for reaching the top, however, was about 50%. The nine day trip, on the other hand, had a success rate of 99% for reaching the top. By committing to spend a little more money, time, and energy, the journey was very enjoyable and successful. There are many routes that you can take for your financial journey—all have different elements. Achieving your objectives requires a commitment to a certain amount of time, money, and energy. Understanding your objectives, “plotting” the acceptable path, and honoring your commitments will help you achieve a higher probability of financial success. Reaching your personal goals is our combined objective. 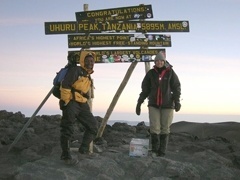 Highly experienced Kilimanjaro guides led us to the top of the mountain. They had summitted more than 100 times! They were experts in climbing, first aid, ornithology, and botany. They navigated the course and set the pace to help us stay on track as we slowly progressed each day. It was their guidance, their pacing, and their experience that ultimately helped us reach our goal. And we completely enjoyed our journey! Highly experienced, trusted advisors act as your guides on your personal journey toward your financial goals. You want advisors that continuously seek out ongoing education and are experienced in traveling financial paths. On your personal journey, we will have the patience and commitment to set the pace for your “summit,” will help you stay on course, and will ultimately guide you toward your goal and help you to enjoy your journey.